Chicago Energy Consultants - News: Waste Reduction - Composting: eaiser than you think.. Waste Reduction - Composting: eaiser than you think.. When I talk to folks about composting, they usually associate the following words with the process: ugly, smelly, difficult. When done properly- composting is pretty easy to do, and yields fantastic results (lots of rich compost for your landscaping or garden)! -Green stuff is most everything plant that comes from the kitchen and the yard or garden. Compost bins can't handle fats, oils, or any animal waste products- so no table scraps, or meat. -Brown stuff is usually dried up plant matter like brown leaves, straw, small twigs, shredded paper (yes your paper was once a plant). -The compost heap, or 'pile' should be moist, but not wet. The feeling of a wrung-out sponge is about right. -Air is important to allow the pile to breath, which prevents anaerobic bacteria from doing their work, which creates nasty those nasty odors. Too much air and your pile can dry out, slowing the composting process. -Direct soil contact is preferred so microbes and critters can crawl up into the pile and do their work, but compost starters can be purchased for more isolated piles. If you want to help the process along, the smaller you chop up your compost-ables, the quicker they will break down. I'm lazy, so I dump my larger organic matter in the bin without much or any cutting, and let nature do the dirty work of breaking it down. This works for almost everything, except for large tubers- they seem to love being stored in compost (it is like a root cellar), and I have recovered what I think are beets that have been in a bin for 6 months and still looked healthy and almost edible. The city adds one extra challenge: rats. Rats love any kitchen scraps, so a rat-safe (read: Fort Knox) compost bin is required in the city.. In fact it is the law! Because of this, it is hard to build your own rat-safe composter, and best to purchase the model the city distributes: the Earth Machine. Lucky us, the city is making these bins available to residents at a discounted price. 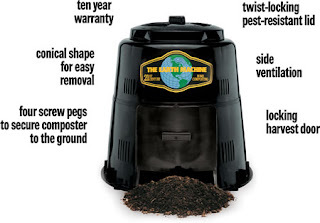 30$ for Earth Machine Compost Bins, which include a 10 year warranty for missing / broken parts (you only pay shipping) from the manufacturer.